Seagate Technology on Tuesday introduced its new breed of hard disk drives (HDDs) for network area storage (NAS) and RAID applications. The new family of NAS HDDs from Seagate includes a model with 8 TB capacity, which is the industry’s first hard drive of such kind that is targeted towards small and medium businesses as well as personal use, i.e, 1-8 bay NAS units. Seagate’s 8 TB 3.5-inch NAS HDD is based on six perpendicular magnetic recording (PMR) platters with 1.33 TB capacity each. The hard drive features 7200 revolutions per minute spindle speed, 256 MB DRAM cache as well as a Serial ATA interface. The manufacturer declares 216 MB/s maximum sustainable media to cache transfer rate, which is considerably higher compared to previous-generation drives. The new HDD have average operating power of 9 W as well as average idle power of 7.2 W.
Seagate’s latest family of NAS HDDs also includes models with 6 TB, 4 TB, 3 TB, 2 TB and 1 TB capacities. Hard drives with 6 TB and 8 TB capacities have spindle speed of 7200 RPM, whereas the remaining drives feature 5900 RPM speed. High-capacity PMR platters, 7200 RPM spindle speed as well as massive 256 MB DRAM cache will help the new 6TB and 8 TB drives to offer very high random read performance, which should be useful not only for NAS environments, but for desktops as well. 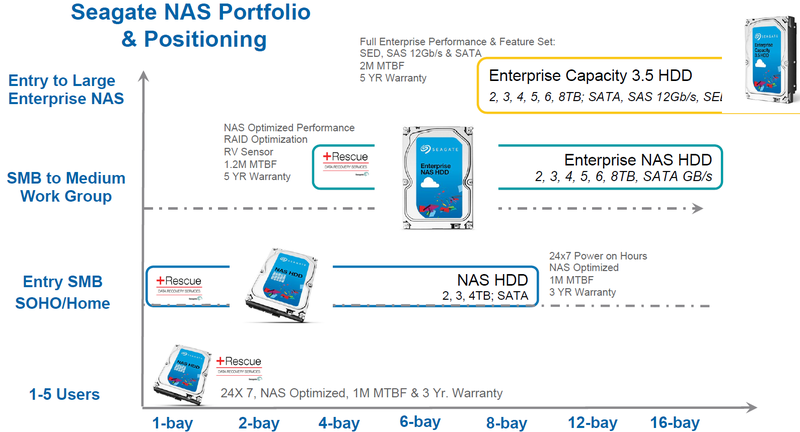 Previously Seagate offered 8 TB drives for archive/nearline, enterprise capacity and enterprise NAS applications. Such drives are optimized for servers, racks, maximum reliability, etc., which comes at a price. The new 8 TB HDD for small and medium businesses (SMBs) as well as creative professionals are designed for tower enclosures with one to eight bays and are essentially the first hard drives with such capacity that are optimized for desktop applications. 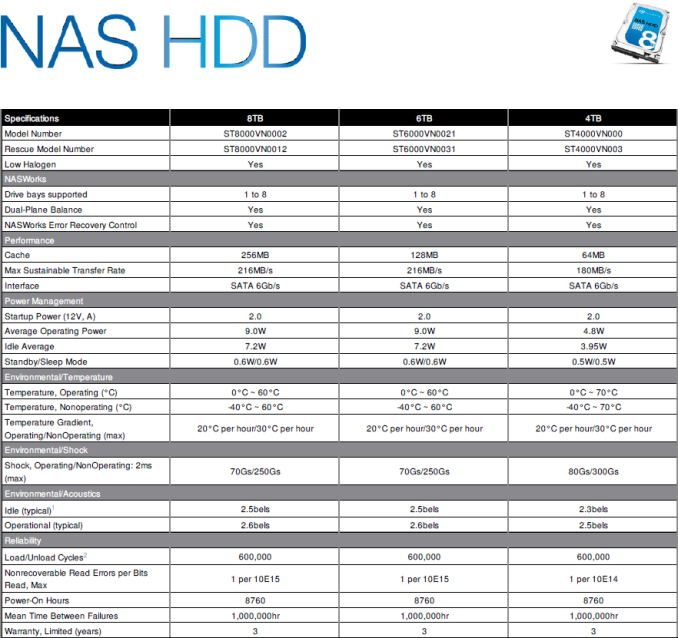 The drives are also fully compatible with select NAS products from companies like ASUSTOR, QNAP, Synology and Thecus. Hard disk drives for SMB NAS applications use platforms that were developed to handle additional vibration, hence, they are more reliable than desktop-class HDDs, but are less advanced that enterprise-class hard drives. NAS HDDs usually feature dual plane balance control, improved heads as well as special firmware. Seagate’s NAS HDDs compete against Western Digital’s WD Red lineup. At present, the maximum capacity offered by the WD Red is 6 TB, hence, with 8 TB offerings Seagate will have a competitive advantage over its rival when it comes to NAS hard drives. 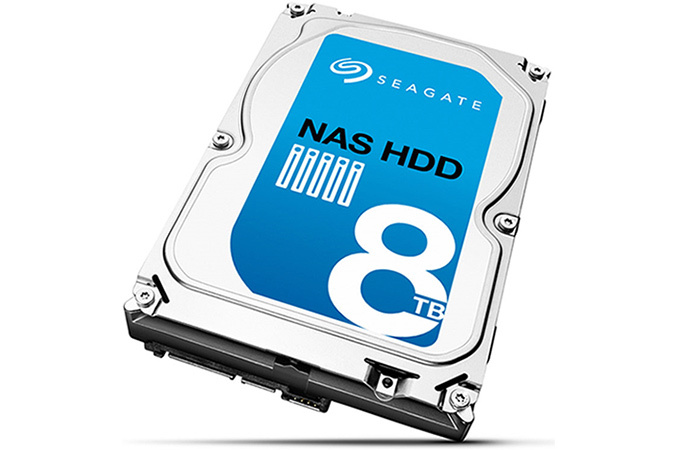 The new Seagate NAS HDD 8TB has shipped to select customers. Wide-scale availability is expected at the end of the Q1 2016. Consumers should be on the lookout for the ST8000VN0002 or ST8000VN0012 models, as they are the PMR ones. Seagate also has a ST8000VN000 model which uses host-aware SMR (shingled magnetic recording).The MSRP of the new 8TB PMR NAS HDD from Seagate will be $385 when it ships later this quarter. == lower price. Not everyone can afford to put in enterprise grade components in their browsing machine.